White Paper Published By: Hitachi ID Systems, Inc. Identity management is the combination of business process and technology used to manage data on IT systems and applications about users. Managed data includes user objects, identity attributes, security entitlements and authentication factors. 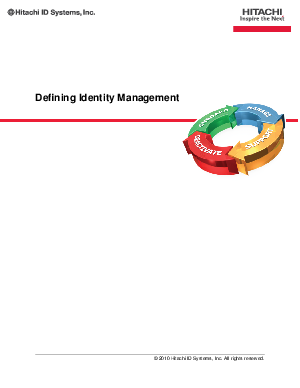 This document defines the components of identity management, starting with the underlying business challenges of managing user identities and entitlements across multiple systems and applications. Identity management functions are defined in the context of these challenges.